Peregrine Clothing, the Bristol, England-based company, opened a pop-up shop on London's Lambs Conduit Street this month. The concept of the shop draws on the company's long heritage, its beginnings as J. G. Glover in 1796 and the introduction of the Peregrine brand in 1956. 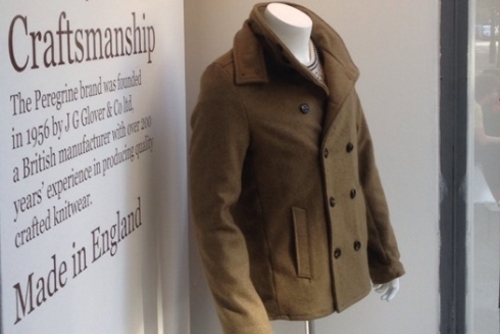 Peregrine's clothes are all made in England. From the shop and select outlets, you can get hold of some pretty heavy-duty no-nonsense English sweaters by Peregrine this autumn. 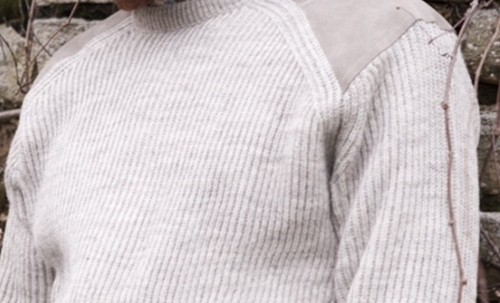 If we were going to plump for one, we'd go for the Suede Patch Jumper. 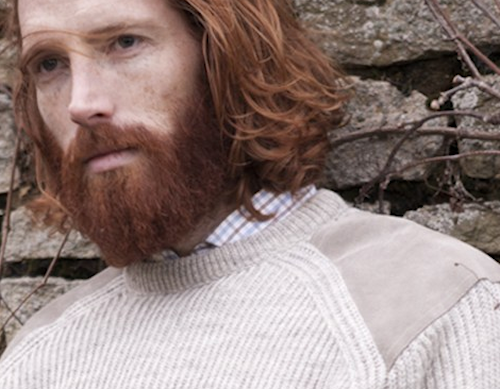 Our favourite flame-haired model is wearing it above. Good to see he's still getting the gigs from Peregrine. Nothing more satisfying than the feeling of something solid in your hands and knowing that what you're holding will give you years of pleasure. Quality in a word. Something made to last. Peregrine's Suede Patch Jumper is such a thing. Constructed in mid-chunky 7-gauge un-dyed British wool, it's available in natural light beige and dark grey wool from a Welsh breed of sheep. Inspired by the classic country saddle jumper, the sweater has hand-stitched suede elbow and shoulder patches on the raglan sleeves in the shooting style. Sunday lunch at the local pub, fishing trip, protest march, this sweater will keep you warm and dressed for the part all winter. We could talk about any number of Peregrine's sweaters, but you might get sweater fatigue, so we'll just mention one more - Peregrine's purple version of the classic Aran. 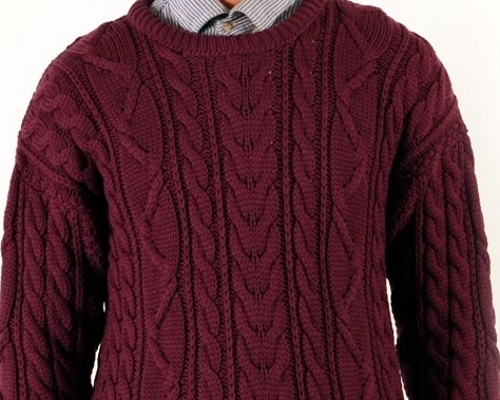 Aran sweaters are generally knitted in white tones and un-dyed shades tending towards beige, but, come on, look at this fellow in purple. A chunky 5-gauge knit, the sweater has classic Aran cabling with raglan sleeves and a thick roll at the neck. Tweedy's Thought: Purples go so well with your classic wardrobe colours, blues, browns and greys. You don't have to be in monochrome to be classic. If you're thinking you'll need some kind of weekend jacket for these fellows to sit under, Peregrine might have the answer there too. 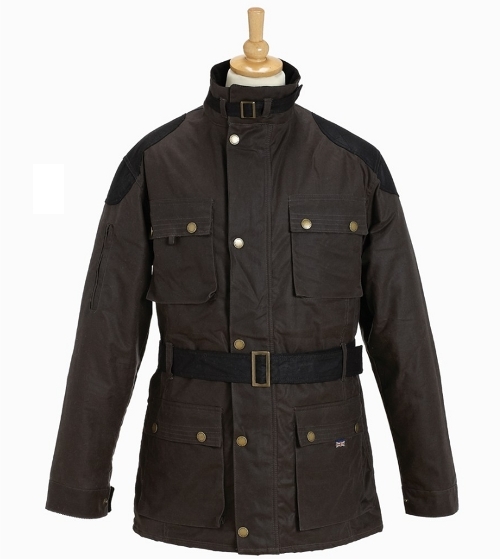 The Woodford jacket is produced in waterproof British Millerain Antique 6 Wax cotton. The jacket is made from a hand cut pattern and machine-sewn by hand. It has a brass buckle, moleskin collar and quilted checked lining. 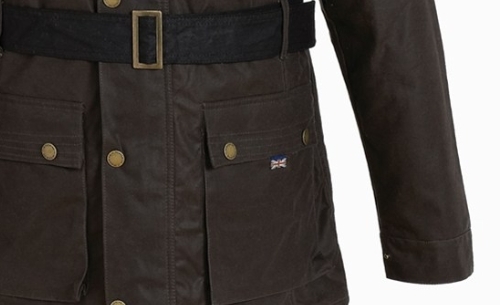 The jacket also has a handy poacher's pocket at the rear. Just add a classic Royal Enfield to complete the look.